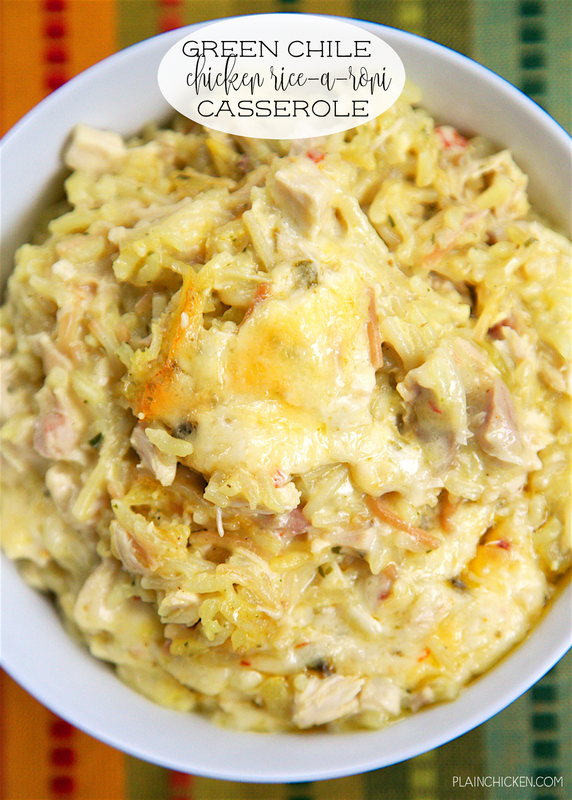 Green Chile Chicken Rice-A-Roni Casserole - comfort food at its best! Chicken Rice-A-Roni, sour cream, cream of chicken soup, green chiles, cumin, pepper jack cheese and chicken. You can make this ahead of time and freeze for later. This is SO good! Our family gobbled this up. Everyone asked for seconds! 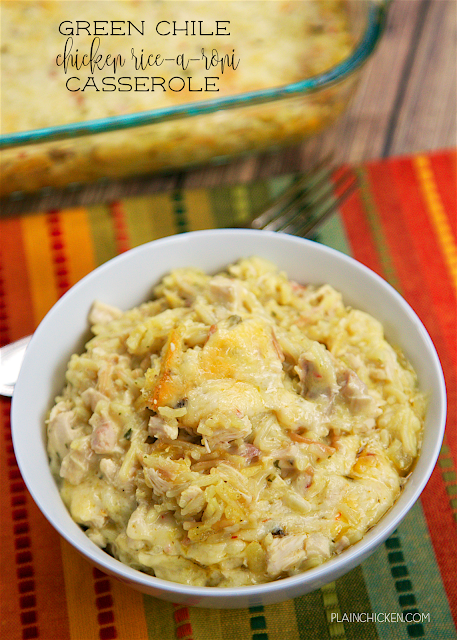 This Green Chile Chicken Rice-A-Roni Casserole was a HUGE hit in our house. We could not stop eating it! It was even great reheated for lunch the next day. Chicken Legs loved this so much that he had me make this two weeks in a row. It is that delicious! Chicken, rice, cheese, green chiles, cream of chicken soup and sour cream. So comforting! 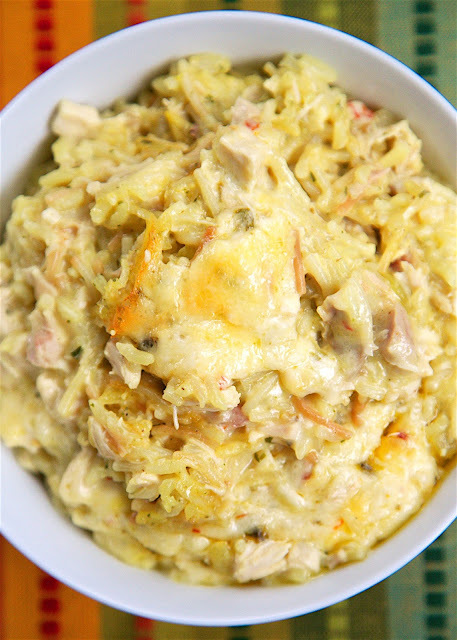 This Green Chile Chicken Rice-A-Roni Casserole can be made ahead of time and even frozen for later. Such a convenient weeknight meal! I actually have one in the freezer right now! Just a note on this recipe- I used a box of Chicken Rice-A-Roni for this casserole, but you could definitely use my homemade version of Chicken Rice-A-Roni in this dish. Either is great. Prepare Chicken Rice-a-Roni according to package directions. In a large bowl, combine sour cream, Cream of Chicken soup, green chiles, cumin, 1 cup of pepper jack cheese and cooked chicken. Stir in prepared rice. Spoon into prepared baking pan. Sprinkle remaining 1 cup of pepper jack cheese on top of casserole. Bake for 25 to 30 minutes, until cheese is melted and bubbly. Sounds very good and easy to boot. I'm always looking for ways to avoid sour cream (personal preference, I just really dislike the stuff). Any recommendations for a substitute? Or could it just be left out? Haha, I don't like Greek Yogurt because it tastes just like sour cream to me! I'll probably just leave it out. Thanks! I made this tonight and we absolutely loved it. I made a modified version of this for my vegetarian niece using the Homemade Vegetarian Rice A Roni dish from VegGirlRD.com and subbing vegetarian (generally mushroom) for anything that was chicken or meat based. My niece L O V E D it! She ate it for dinner on Saturday, lunch on Sunday, and took the rest for her school lunch on Monday. AMAZING!! She does prefer a more mild flavor profile so I used Monterey Jack instead of Pepper Jack but we all enjoyed it and she inhaled it. This has gone into our regular meal rotation. Even my carnivore husband enjoys this as a vegetarian side dish. Thank you for continuing to share awesome and versatile recipes!! Made this last night and everyone loved it. Husband said the lunch leftovers are going to be great. Thanks! This is an awesome recipe! Thank you for this one. My husband and I both just loved this stuff. I saved the recipe as I usually do, but after we ate it, that one went into our family favorites folder. SO good!! Do you think this would freeze well? My son loved it so I thought I might make some and freeze for him to take to college. I think it would freeze great! I just made this for myself and my husband to try it out and then a cousin who wasn't well and couldn't cook for her family. We all loved it! Didn't last long! :) Will definitely be making this again! I made this to go with our smoked baby back ribs tonight and it was VERY good! Truly enjoyed it! I dont have chicken rice a roni. Can i use the creamy four cheese one instead? Made this last night. I added crispy onion bits over the cheese on top to give it a bit more crunch. Rave reviews!